I know I have said this too many times already, but, I LOVE Shimmer Polish! 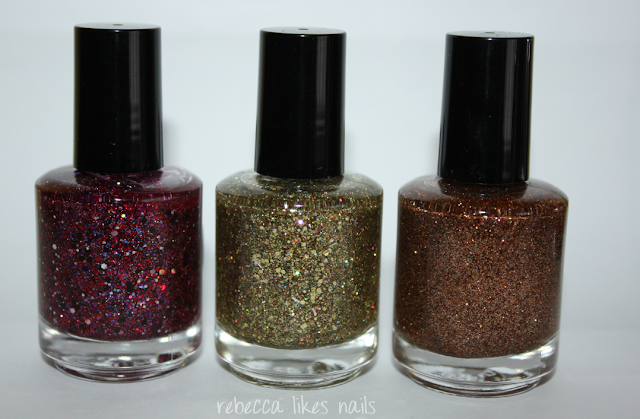 As I say every time, Shimmer Polishes are very complex and full of so much fun glitter. One of my faves. Nice mix of glitter, red tinted base, easy to wear alone but I decided to layer it to give a different look at it! It's fun over the purple, dontcha think? All gold everything! Well, not everything, but most of it. Love this! So sparkly and fun. I think it looks great over this peach and really trendy. Just look at the tiny microglitter and all the different shapes and sizes and colors of glitter... So much going on! Shimmer Polish is complex. Haha! This one is a bit hard to describe I think... Bronzey brown and black? Maybe some gold? It covers well on its own which is why I can't really remember what I put under it, but this is two coats over the base color. Beautiful as always but probably not one I personally would wear often.